Comments Off on Tiny Toones on TV! “Meeting the students of Tiny Toones convinced me that all the hardships only make these young people better, stronger and kinder in life. Almost everyone has a compelling story to share, almost every one of them was worthy of a documentary. And the talents in these young people were just mind-blowing – our crew had a blast just filming all of them breakdancing.” Loh Kok Hong, TV producer and director. One of the best things about being an NGO working in the creative arts is that it brings us together with other creative people from across the world. Loh Kok Hong is one of those people, responsible for a fantastic half hour documentary which recently aired on Singaporean TV, and which we’ll be showing in full on our website very soon. We’re not a big wealthy NGO able to pay for marketing or fundraising staff, so having friends like Kok Hong is crucial to helping us get the word out and raise money we urgently need. The documentary was the first in a series about social activists around Asia. 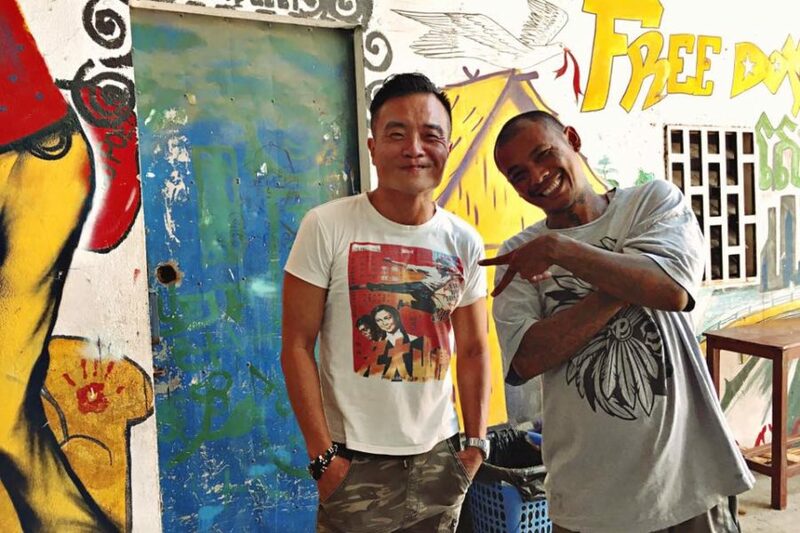 Loh Kok Hong and his presenter Fadli Kamsani came to Phnom Penh, spoke to KK about how Tiny Toones was born, and showed B Boy Slick’s extraordinary journey from homelessness and drug addiction to a career as an international performer and teacher. We spoke to Loh Kok Hong about why he filmed Tiny Toones. Thank you Loh Kok Hong, you will always be very welcome at Tiny Toones. Please check our Facebook over the next week, when we’ll be airing some excerpts before featuring the full documentary on our website. If you wish to support our work with a donation or learn more go here. Recently, founder KK spoke to a journalist from Fah Thai magazine – the inflight magazine of Bangkok Airways – about his past, where Tiny Toones came from and the importance of having a place like Tiny Toones in a city like Phnom Penh. The article will feature in the Fah Thai magazine on planes for 2 months and there is a very nifty electronic version of the magazine so you can check it out without having to catch a plane. Note: Credit to Stuart Isett for the last 2 photos in the article. Recently, some of the Tiny Toones staff were interviewed and featured in a news article published by the Christian Science Monitor. Founder KK and General Manager Shhort spoke to the CSM reporter about the Tiny Toones program, the challenges, the successes and about making a difference in the lives of children and young people in Cambodia. Phnom Penh’s arts and entertainment weekly paper, ‘the Advisor,’ came to visit the Tiny Toones center to interview the twelve children (aged 12 to 19) involved in the album’s creation. They also spoke to DJ Voch – music teacher and resident DJ who created the backing tracks for the album – and General Manager Shhort for their article. ‘Anakut’ translates to ‘the future’ in English, and this sets the mood of the record with the children writing lyrics about their hopes and dreams for their futures and the future of Cambodia. Tiny Toones featured in this Pacific Scoop article from New Zealand.